The demand for Southampton tickets continues to grow as The Saints continue to establish themselves in the Premier League as a leading club following their promotion back to the top-flight in 2013. The 1976 FA Cup winners have been able to assert challenges for the European positions in recent seasons and have rivaled the top clubs in England. Football Ticket Pad had a variety of Southampton tickets available for their matches at St Mary’s Stadium with seats available for their matches in the Premier League, FA Cup, Carabao Cup tickets. Southampton were relegated from the Premier League on 15 May 2005, ending 27 successive seasons of top-division football for the club. They returned after a seven-year absence, and have played there ever since. Match tickets to watch The Saints are listed for all of their home and away matches in the Premier League giving fans the chance to watch Southampton both at St Mary's or at a host of other amazing top flight venues across the country with designated 'Away Section' tickets. Southampton are renowned for their highly successful youth academy, with a number of teams from ages nine to 18 years. Recent products of the club's youth system include England internationals Adam Lallana, Theo Walcott, Alex Oxlade-Chamberlain, Wayne Bridge and Luke Shaw. The club also honed the talents of Real Madrid and Wales winger Gareth Bale and young talent continues to filter through to the first team on a regular basis. The club often have to sacrifice their star players for hefty transfer fees as big clubs fine pick their crop of talent. The likes of Virgil Van Dijk joined Liverpool for a record fee of £75 million, with Sadio Mane, Adam Lallana, Dejan Lovren all joining Liverpool in the past seasons for fee's over £20 million each. The Saints continue to attract talented international footballers from across the globe and this is what makes it an exciting proposition when buying Southampton tickets. Southampton maintains a rivalry with numerous south coast clubs, their biggest being Portsmouth. However, in the Premier League, Bournemouth is their closest derby match and Southampton v Bournemouth tickets are always popular with Football Ticket Pad. Fans can also watch The Saints test themselves against the so-called 'top six' as they bid to climb the table and secure a mid-table position. St-Mary’s Stadium is a relatively new and modern stadium having been the home of Southampton since August 2001. It is the largest football stadium in the South East of England holding over 32,500 fans. The stadium is a basic design with four stands of equal height surrounding the playing surface. The Itchen Stand and Kingsland Stand are located in the East and West of the ground and are the Longside seats. The Northam Stand and Chapel Stand are the two seating areas behind each goal, where Shortside Upper and Shortside Lower tickets are hosted. Due to the stadium cantilever roof, there are relatively unrestricted views throughout the stadium. Longside Upper: These seats can provide great views of the action and can be found in the upper tier of the Itchen Stand and Kingsland Stand which run alongside the touchline of the pitch on both sides. Fans can enjoy seats on the halfway line and a view almost as if you are watching the match from the comfort of your armchair! Longside Lower: If you want to be close to the pitch then there are not many seats that allow you to get as close to the players and the manager as Longside Lower seats. Similar to Longside Upper, these seats can be found in both the Itchen Stand and Kingsland Stand. Longside Lower tickets in the Itchen Stand can have you next to the players dugout and a great view of the match with the added bonus of seeing the managers prowl the touchline and bark instructions to their players. 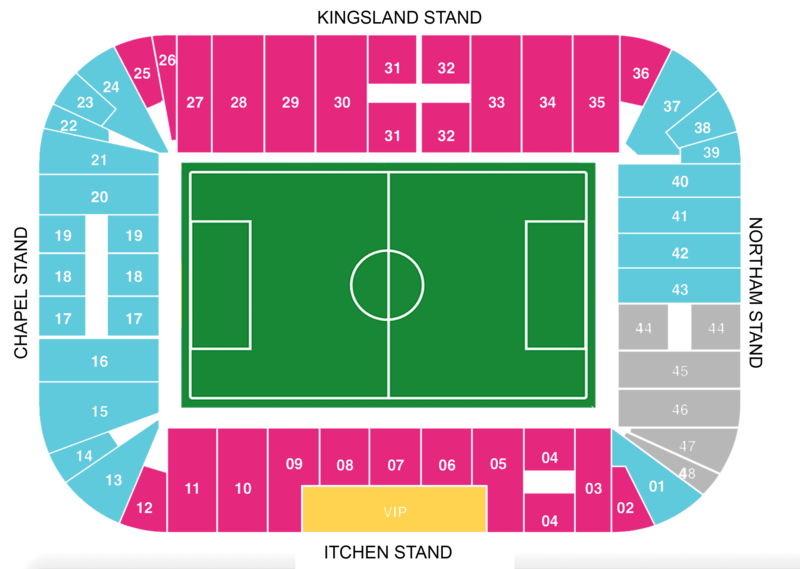 Longside Lower seats in the Itchen Stand will be in Blocks 3-11 and in the Kingsland Stand, blocks 27-35. Shortside Upper: These tickets are hosted in the upper sections of both the Northam Stand and Chapel Stand behind each goal. The Northam Stand houses the majority of the clubs vocal supporters which makes for a passionate and noisy afternoon, especially with its close proximity to the away fans! However, the Chapel Stand is a lot quieter and is the Family Stand which makes it a perfect option for families after a good day out at the match with decent views. Shortside Lower: These are often the cheapest tickets in the stadium and can be found in the lower tiers behind each goal in the North Stand and Chapel Stand. Both stands make for a great atmosphere for Southampton fans looking to catch The Saints live at St Mary's. Blocks 17-19 are popular for fans looking for Southampton tickets in the Chapel Stand. VIP Hospitality: Southampton Football Club has a selection of VIP hospitality tickets for their matches at St Mary’s Stadium and Football Ticket Pad has a limited number available for some of the biggest matches. There are numerous hospitality packages available and Football Ticket Pad can source Southampton hospitality tickets on request. The club hospitality suites and executive boxes can be found at the rear of the Itchen Stand with a choice of 42 executive boxes with various Southampton VIP tickets listed. Southampton hospitality tickets is a fantastic way to watch The Saints at home so why not see what Football Ticket Pad can offer! Away Section: At St Mary’s the away section are housed in the corner of the Northam Stand with an allocation of over 3,000 supporters for Premier League matches and over 4,000 for FA Cup and EFL Cup matches. Away section tickets are available for some of the biggest matches and an away day on the south coast should provide great entertainment for avid football supporters following their respective teams. Season / Members Cards: These are seats allocated to Southampton club members and season ticket holders who have made their matchday seats available for games at St Mary’s Stadium. Football Ticket Pad customers will receive their Season / Members card for the required match by collecting the tickets in plenty of time from an agreed collection point before returning the tickets in a prepaid envelope after the match. To gain entry to the stadium, customers must scan their card at the turnstile shown on the card. E-tickets: These are only used for Football Ticket Pad customers who have purchased Southampton hospitality tickets or Southampton VIP tickets at St Mary’s. Once your hospitality ticket has been purchased, you will be sent an email from Football Ticket Pad which will include your e-ticket to gain entry to the stadium. Customers can either print off the e-ticket or present the barcode on their electronic device. There is plenty of corporate hospitality suites options at St Mary’s including in the Itchen Stand which offers central seats on the halfway line or the opportunity to sit in one of the 42 executive boxes towards the rear of the stand. Paper tickets: Paper tickets are also provided by Football Ticket Pad and customers can receive their ticket 3-4 days prior to the match. Your Southampton ticket will be sent to the billing address provided in the original transaction and will be sent an email confirmation when their tickets have been dispatched. Customers then scan their paper ticket at the turnstile printed on the ticket to gain entry to the stadium. Despite a disappointing Europa League exit to FC Midtjylland in qualification, as well as early exits in both the FA Cup and Capital One Cup, The Saints went on to have a successful season in the Premier League and finished in sixth to secure Europa League qualification for the 2016/17 season. Sadio Mane and Graziano Pelle led the goalscoring charts with 11 goals each under Ronald Koeman. Southampton had a slow start to the season, but an impressive 3-1 triumph over Chelsea in October kick-started their season. The Saints also went on to secure comprehensive wins against Arsenal, Liverpool and Manchester City at home. Their record on the road wasn’t too bad either, recording victories at both Manchester United and Tottenham Hotspur as The Saints secured European football for a second successive season at St-Mary’s. Southampton established a real identity under Ronald Koeman and they will be hoping to continue their Premier League assault as they try to break into the top four and establish themselves as a leading Premier League side. Football Ticket Pad customers with Southampton tickets would have been pleased with what they saw last season on the south coast and fans will be hoping for more of the same this time around.